The OIT Mobile and Web Strategy group partners with UCLA Technology Development Group every year to run a mobile app contest called Code for the Mission App Competition. 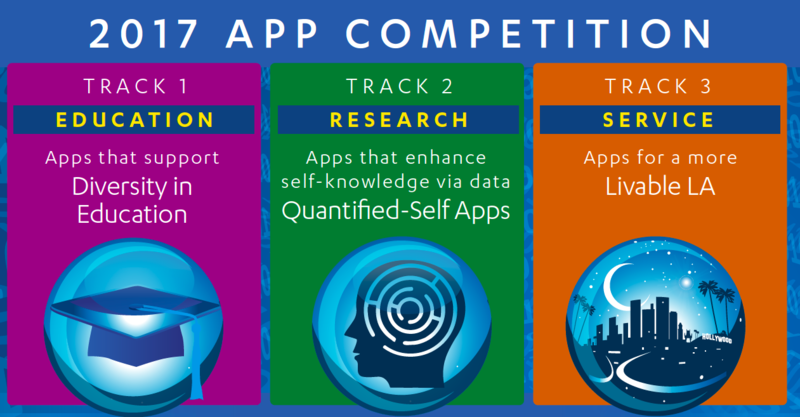 The goal of the competition is to encourage the UCLA community (Faculty, Staff and Students) to develop innovative mobile apps (both native and web-based) that further UCLA’s mission of Research, Education and Service. The Code for the Mission Team works to offer faculty, staff and students an innovative and collaborative contest that is exciting and fun, but doesn't require losing any sleep (see the definition of "hackathon"). The competition is announced during the winter quarter and runs through mid-September when winners are announced and prizes awarded at The Mobile Experience Conference Mobile Experience. Teams of up to six participants form independently or "Meetup" at events and register as project teams. A mobile development boot camp is typically offered during April and teams may qualify for entrepreneurial workshops as well. The final submissions are due at the end of the summer on August 31st. Prizes of $5,000 or more per track are awarded after the final keynote session at The Mobile Experience Conference and a Code for the Mission Winners Reception is held that evening. Each year, the Code for the Mission contest will announce three themes. One in the area of Education, one in the area of Research and one in the area of Service. A winning App in each track will be selected to win a prize. In past years, the prize has been $5,000 per track. Additional prizes may be added. Code for the Mission participants may form teams of up to 6 members. One member of the team, must have an active UCLA affiliation, faculty, student or staff. The site has a Project Board and teams can virtually advertise for skills that they need. In person, on-campus Meetups and "speed dating" networking events will be held during the 2016 winter quarter to aid the formation of teams.